Jumia celebrates at the New York Stock Exchange. It isn’t hyperbole to describe last week as a turning point for the African startup ecosystem. The obvious reason: The successful initial public offering of Jumia. Yet it’s bigger than the e-commerce company, and it’s a tide that had started to turn since the second half of 2018. Jumia, now listed on the New York Stock Exchange, may not represent the greatest of financial boons for a majority of African investors (though South Africa’s MTN is still its largest shareholder—for now). Getting the IPO—Africa’s largest e-commerce service, operating in 14 countries—off the ground represented a coming of age for a sector the world’s biggest capital markets and investors often have portrayed as a well-intentioned but fanciful dream. That was particularly clear for anyone with a perspective drawing on experience on the continent and from beyond. Back in 2015 the then-African Internet Group (now Jumia) would have been among the few African startups worth a closer look from US tech investors for an international play. At the time it might have seemed like too much effort for too little return, especially if you’d just been investing in something at the scale of an Alibaba. Also, no one, especially investors, likes to be first. And the lack of an obvious likely exit was also a challenge. That was also discouraging for many big name African investors invited to back local startups. You could make a good case that that changes now. Arguably, it’s already changing. Already in the first quarter we’ve had two nine-figure later-stage funding rounds with Andela’s $100 million Series D in January and this week fintech player Branch raised $170 million in a debt and equity Series C round. Impressive rounds are happening in all types of sectors—off-grid solar company PEG Africa raised $25 million in debt and equity for its Series C last month. 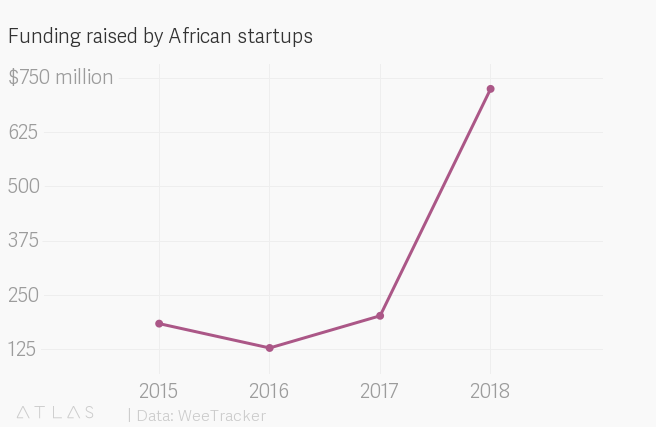 Depending on whose numbers you use, African startups raised between $700 million and $1.2 billion last year. As the pipeline of well-run businesses improves, interest is growing in new funds being created to target later- stage African startups. They’re moving well beyond the experimental, impact-only, five-figure grant model seemingly necessary to get things started in many African markets even five years ago. It’s worth noting a turning point means we’re just on to the next stage for African startups. The bar is raised, and the standards will need to get higher to justify bigger investments and tougher due diligence. Overall, this is a good thing. The scene is not supposed to be perfect. So this is true progress.